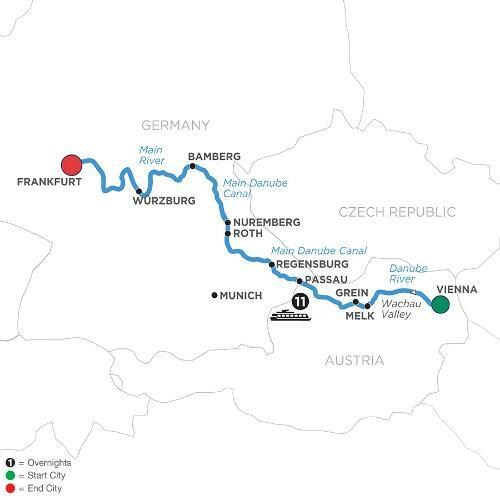 Your Christmastime river cruise begins in Vienna, the capital and treasure of Austria, and ends in Mainz, Germany. In Vienna, see the sights with a Local Guide, or opt for a culinary walk through the Christmas markets to taste some of the traditional fare. Cruise through the picturesque Wachau Valley to Melk, and visit the Benedictine Abbey, one of Europe’s most architecturally-breathtaking monasteries—sure to be truly magnificent during the holiday season. In Regensburg, one of Germany’s best-preserved medieval cities, see the sights with a Local Guide and savor local sausages and beer at one of Germany’s oldest restaurants, Historiche Wurstkuche (Old Sausage Kitchen). On to Nuremberg where, after your guided tour, you are free to visit the Christmas market, one of the most famous in the world. A full-day excursion to Munich shows you the Bavarian capital. The traditional Christmas market is located on the Marienplatz, with aromas of toasted almonds, roasted chestnuts, and gingerbread filling the air! Continue your Christmastime river cruise to Bamberg, a UNESCO World Heritage Site, where the many nativity scenes exhibited throughout the town are sure to delight. In Würzburg, on the River Main, visit the ornate Bishop’s Residenz—home to the largest ceiling fresco ever painted, then stroll through the Christmas markets while you sip Glühwein (hot mulled wine). Your last stop is at one of the charming small towns dotted along the river—sure to be even more appealing illuminated with Christmas lights and decorations. Your delightful festive cruise ends in Mainz.